Entry requirements: A bachelor degree with a 2:1 (hons) in a social science, humanities, or a related subject. Develop the skills and knowledge to produce meaningful social research with this challenging programme. Core modules will teach you how to turn social research issues and questions into workable research designs, as well as handling quantitative and qualitative data and issues such as ethics and funding applications. 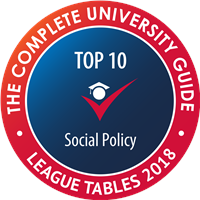 You’ll also have the chance to specialise through a choice of optional modules, allowing you to focus on research in topics such as disability studies, care, social policy analysis, criminology and evaluation of programmes and policies. This taught programme has recently been redesigned to meet the new postgraduate training and development guidelines of the ESRC, meaning it stands alone as an MA but will also prepare you to apply for doctoral research in the dynamic fields of social science research. You’ll be well prepared to become a specialist social science researcher, supported by expert tutors across our active research centres and institutes. You’ll learn in a research-intensive, stimulating environment. As well as the Leeds Social Sciences Institute which fosters collaboration, you’ll benefit from the interdisciplinary expertise hosted by the Centre for Disability Studies, Centre for Ethnicity and Racism Studies, Centre for Interdisciplinary Gender Studies and many others. All of these centres run their own calendars of events such as workshops and seminars. Find out more about Research in the School of Sociology and Social Policy. At the start of the programme you’ll build your knowledge of research design, learning to connect abstract theoretical and methodological perspectives with practical research strategies. Sampling and selection, choosing the right data collection and analysis methods, the ethics and politics of research design and creating research proposals will all be among the topics you explore. You’ll also have the chance to deepen your subject knowledge with your optional module. You could focus on crime, social policy analysis or evaluative research as well as disability studies, care or social thought. In semester two you’ll begin intensive training in analysing quantitative and qualitative data. You’ll learn to use statistical software, design surveys and questionnaires and record, code, organise and manage qualitative data. You’ll evaluate different research methods, understanding the benefits, limitations, and ethical implications of each one and when to use them. By the end of the programme in September, you’ll submit a research project that puts the skills you’ve gained into practice – and perhaps lay the foundations of your future research. We use a range of teaching and learning methods to develop the research skills and theoretical knowledge you need. These include seminars, tutorials, and presentations. You’ll also attend practical sessions and workshops where you’ll get to grips with data analysis. Independent study is also vital to this programme, allowing you to refine your skills and prepare for your taught sessions. You’ll experience different assessment methods, including presentations, literature reviews, research proposals and essays. In data analysis modules, you’ll be expected to analyse and engage with data within your essays. We offer plenty of support with aspects such as academic writing. In the last decade there has been enormous growth in social research, leading to an increasing variety of career options. There are a number of different research environments, such as academic departments, third sector organisations, private research organisations and governmental agencies – all of which have distinctive research cultures. There is an increasing emphasis on the production of high quality, rigorous and meaningful research by professionally trained researchers. We designed the MA in Social Research to provide such training, and the course will interest people pursuing, or enhancing, a research-related career in a wide range of settings.